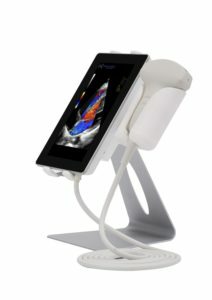 Sonoscanner, Europe’s leading manufacturer of portable and ultraportable diagnostic ultrasound systems has announced the launch of its new, fifth generation U-Lite device, a full featured, digital auto-optimizing system with 11 interchangeable transducers for every clinical application, anywhere. The latest version of the U-Lite series has a unique, integrated digital manager for continuous optimization of pulse contours, image reconstruction, and feature enhancing signal processing. Able to handle all conventional clinical uses, the great potential of the U-Lite is its ability to easily create new uses for ultrasound. This has already been the case with super low noise and high frame rate presets and transducers that achieve submillimeter axial and lateral resolution and a standardized gray scale display while retaining penetration”. The optimal size of the U-Lite was developed to meet the specifications needed in the routine, daily practice of medicine. For example the system fits into the pocket of a white coat, has the biggest possible HD screen, and can be operated with one finger.